Our healthcare system is set up for the enrichment of doctors at the expense of patients. Here is a great article showing this yet again. When you go get a fast food hamburger for $1.49, you will only extremely rarely receive a poorly made burger or have a billing mistake or get food poisoning. So why are you virtually guaranteed to not get what you pay for and get overbilled anytime you visit a hospital? The doctors union has strictly prevented any kind of competition and innovation in healthcare. I stopped drinking for 500 days and then about three months ago started drinking occasionally again. I don’t think this is a wise decision. I can tell alcohol still is a problem for me. I started to crave it again slightly. I feel like there is a gut bacteria that processes / demands alcohol. I thought I read something about that. It is also tough to stop drinking unless everyone else around me stops too. I think it is safer and better to just not drink at all. 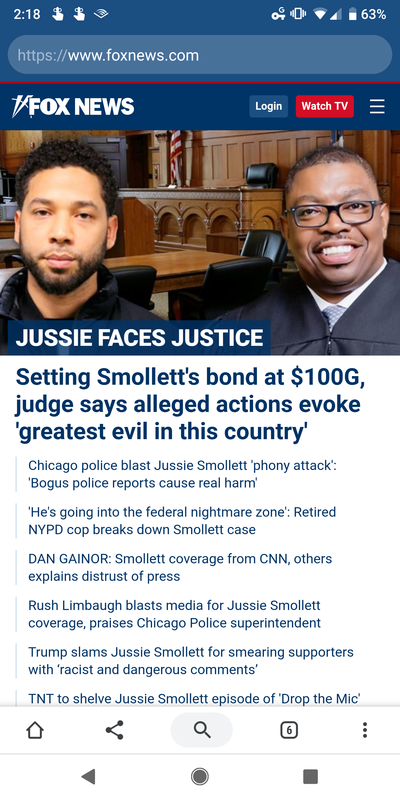 Fox News top 15 stories today are all about an idiot named Jussie Smollett who apparently faked a hate crime attack on himself. I agree that Mr. Smollett should get jail time if this is a hoax, but it is deeply concerning that this series of stories is being used to bury a truly important national news story on a Republican governor who admitted to election fraud. 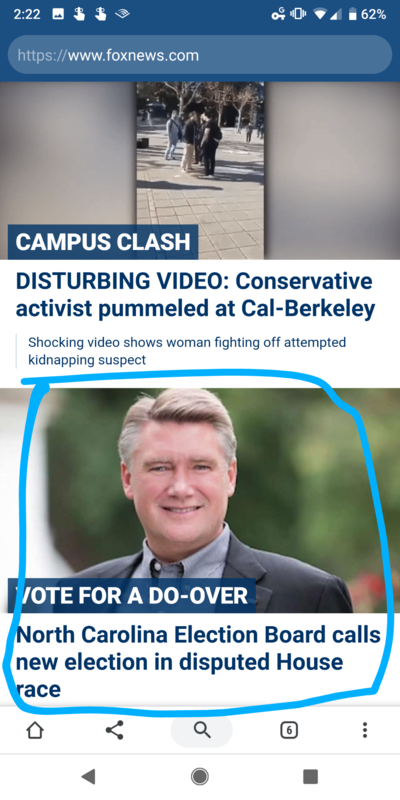 Buried a couple of dozen stories down, under a video of a on campus fight, you will find a fairly misleading headline on the election fraud issue. I am a libertarian, but I really dislike the extreme bias and twisting of the facts put on by Fox News. We have a way to save people’s lives at a minimal cost, but we don’t use it. A kidney donor can directly save the life of someone who’s life is in immediate danger. However, donating a kidney requires the donor to undergo a major surgery and a lot of inconvenience. Right now, it is illegal to pay someone for their kidney, hence very few people donate. If you allowed them to be paid, donors would come forward in far greater quantities this saving many lives. Just set up an auction system and once potential donors see kidneys being auctioned for $100,000+ apiece, many more donors will come forward. 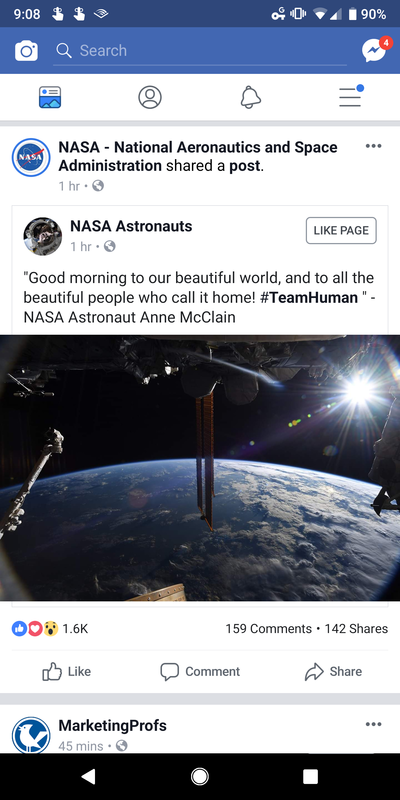 I loved this post from NASA today. We are all lucky to be alive. How about if instead of spending billions building walls and going to war with each other, we try to help others instead? The very best way to destroy your enemies is to make them your friends. To become a dictator, you must destroy the free press. I read Mein Kampf and Hitler was extremely explicit about this. Trump has now attacked our free press more than 1100 times in speeches and tweets. Do Americans really want to end up in a dictatorship run by Trump? I read this post by a fellow dying of cancer titled, “Leukemia Has Won”. I think this makes it sound like he had a moral failing and that is why he is now dying. The other side of the “Leukemia has won” coin is that “I have been defeated”… like he didn’t try hard enough. I am sure this fellow and others with cancer do everything possibly can to find a cure and heal themselves. I am sure there is no lack of courage or strength that leads to people dying of cancer. We need to change the language we use here… We will all die eventually, but that is not a defeat if we lead a good life. I think it is very important to note that while it is vital that we fix the excesses of capitalism (tax wealth not income, eliminate loopholes, increase transparency, remove artificial barriers to entry, reform patents), that other forms of economic order are far worse. Socialism has led to totalitarianism in each case it’s been tried… We now have many examples of this. Venezuela is just the most recent. Grandma: Glad you got it right. Convince others in your age group. Joel: Socialism has been proven to be a failure, but I think the reason Millennials are turning to Socialism is that the last two generations screwed up democracy and capitalism. Millennials have far less purchasing power than previous generations due to entitlements like Social Security and Medicare that have been taken by older folks at the expense of the youth. Nimbyism has prevented new housing from being built, increasing the cost home ownership to out of reach for Millennials. Russia finally found a war it could win- not military, not economic, but through propaganda. Now we have a traitor in the White House, the British are fighting themselves, and NATO is greatly weakened. Putin is laughing at us while he conquers Ukraine and chunks of the Middle East. The last two generations gave lip service to “live free or die”, but sponsored evil dictatorships like Saudi Arabia (look up Mohammed Bone Saw). America is losing its moral authority. The military itself is a giant socialist machine… We spend vast sums of money on boondoggles, corruption, and evil. A standing military is built only to win the last war. We are like the French with their Maginot line prior to WW2. Our next enemy will just go around the giant overpriced socialist military. And ultimately none of this really matters as true general AI has already arrived and a massively superior species is rising and our extinction is imminent. Max: Venezuela is not an isolated control of Socialism if you compare it to the economic success of the United States. There are a lot of factors that have led to the disastrous situation. The NHS in Britain is socialist. Public Libraries are socialist. Government-owned airlines are socialist. The California public university system is socialist. Worker cooperatives are socialist. Joel: Max, You raise interesting points. I agree that socialism, to an extent, can be reviewed in specific industries like healthcare or libraries vs nations as a whole. I think when viewed at the nation scale it is clear socialism doesn’t work across the examples we have. I am not sure that the examples you provided would be considered successes though. Britain’s NHS has long wait times and poor quality service. Airline travel costs plummeted after privatization. There’s a reason people spend a lot of money to send their kids to private school even though there is a free public option. Teachers unions have warped education to be about maintaining teachers salaries rather than achieving great outcomes for kids. You can’t fire a bad teacher, and a good teacher has no motivation to go above and beyond due to seniority based pay. I think the military industrial complex we have is an example of socialism… Government money used in vast amounts to finance boondoggle projects which people want to use so we end up in wars paid for by the government that are bankrupting our economy. I think Republicans and Democrats in our country have lost sight of actual principles and now just fight each other without thinking why. Joel: Also, I really hope the Republicans and Democrats put forward centrist candidates who are stable and intelligent. It would be a nightmare to have a Green New Deal / Bernie Sanders candidate versus Trump. Both come from failed ideologies (the old new deal failed and socialism leads to dictators… And Trump is Putin’s pawn who is destroying America’s alliances that won WW2 and the Cold War). Trump opposes free markets by supporting regulations protecting his cronies, and causes extreme harm to America’s system by dodging taxes he legitimately owes. He committed criminal tax fraud when his father died to avoid taxes, but the statute of limitations has expired sadly. We need stable leadership. Unfortunately, screaming talking heads on TV and insanity on social media is what gets attention, not reasonable people actually discussing ideas. Michael: Just assign your Social Security benefits to me and I’ll agree to whatever anti-socialism thesis you want to propound. Joel: The real problem with entitlements is the opportunity for abuse. People who legitimately need help should receive it. However, far more people than those who need it end up getting entitlements. 10% of America’s GDP goes towards entitlements. Several of my own family members spent their entire lives collecting various forms of entitlements (disability, Social Security, welfare)… and these are healthy individuals who could have worked and would have been better off working. I’m sure you have firsthand examples you can think of… we all do when half the population is on the dole. https://www.washingtonpost.com/…/who-receives…/…. Socialism is just entitlements for everyone… and when everyone has entitlements, no one works. If no one works, those entitlements can’t be given. If people don’t receive entitlements they expect, civil unrest happens. Then dictators rise to power and force people to work (inefficiently). And then you end up with Venezuela, Cuba, USSR, North Korea, China, Ethiopia, Somalia, etc. Client deals… I perfected this to a formula so my salespeople can do it themselves without me now. Understand the situation before you start. You need a clear understanding of your position, the other parties position, the environment you are operating in, and potential additional items you can add in to take the negotiation from zero sum to benefiting everyone. If you don’t know, ask questions and do research. Who is the decision maker? That is the only person you want to negotiate with, not underlings in most cases. Know your points of leverage and the other parties points of leverage. If you absolutely must have a deal and the other party doesn’t need it, you better hope you can win them over with friendliness. The counterpoint to this is when you don’t need a deal but the other party must have it, patience will usually reward you. Make the first offer. This allows you to establish the baseline that you work from. Once you establish a point where you want it, it’s unlikely the other party will come back with something crazy different than what you proposed. Don’t be afraid to lowball, even if the other party knows that is what you are doing. If you are friendly, most people will just make a counteroffer and continue the discussions. Be fair. You have to live with the other party after the negotiation in most cases. If you really don’t treat them well, they will figure it out and make your life painful for it. Be honest. 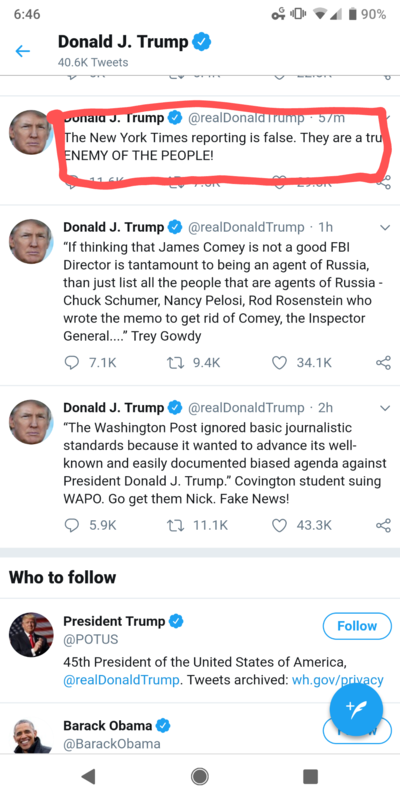 This relates to the Be fair point… if you lie about your position and the other party finds out about it, you will often find yourself in a lawsuit or fighting to get a very hostile counterparty to work with you. Listen. The first thing you do in any negotiation is listen. You should spend most of your time listening to the other party if you are a savvy negotiator. When you are talking, you are not learning. Never get mean. Try to stay cool and depersonalize disagreements. Don’t negotiate angry as that often pushes parties apart. When I have gotten angry, the situation almost always ends poorly for me. Know your walkaway point. You don’t always need a deal in most situations and be willing to walk away from a deal that is bad for you.